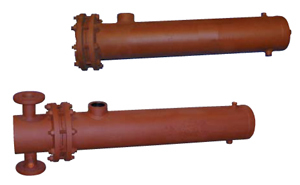 Leak Guard Series Double Wall Steam to Liquid Heat Exchangers are built in accordance with ASME Section VIII in a wide variety of materials, so you can choose just what you need for your application. Shells, heads, tubes, tube sheets, separators and tie rods are all available in optional materials. To help assure the high quality you expect from Taco, we do all fabrication in house. Maximum Temperature: 375° F. Standard, 450° F. Optional.